At K.R. Mangalam, we believe in imparting quality education that goes beyond text books,teaching that develops critical thinking, problem solving and decision making in the students. Stress on honing multiple intelligence. Our main aim is to provide in depth knowledge of concepts. Integration of technology with traditional blackboard and chalk in the classroom. Extensive use of technology harmonizes class room teaching and learning process help rank KR Mangalam School among the top 10 schools in Greater Noida. The teachers are trained to make their lessons highly effective by using 3-D images, animations and videos in the classrooms resulting in a multi – sensory learning experience for students. Integrated approach with emphasis on project based learning towards education A spirit of enquiry goes hand in hand with the sound acquisition of language and numeracy skills. Our aim is to offer a broad and balanced curriculum. ‘Practicals’ and hands-on experience from Class II onwards. Our curriculum focuses on activity based learning and learning by doing. Lessons are well planned keeping in mind Bloom’s Taxonomy and Dimensions of Learning. Students are provided with the opportunity to observe, explore and interact with the environment thus encouraging them to discover and develop an understanding about the same. Homework given to students is a stimulating revision exercise generally in the form of worksheets. A lot of stress is laid at this stage on spoken English with emphasis on good pronunciation and diction coupled with excellent reading and writing skills. Educational trips and excursions are organized on a regular basis to make learning fun and meaningful. Students are encouraged to opt for a variety of project activities and are exposed to the concept of experiential learning. The curriculum is contextual and flexible with main stress on development of communication skills. All through the year various plays, dramas, competition etc. where in hundred percent participation of students is ensured. The main aim is to develop the in depth knowledge of the concepts. English, Hindi, Math and EVS till class II. In class III and IV EVS is segregated as Science and Social Studies. From Class V onwards English , Hindi , Maths, Science and Social Science are taught as core subjects. Language options are offered from class V onwards. At Middle School Students we prepare students according to CBSE curriculum. Other subjects :- G.K, Computers, Robotics, P.T., Tennis, Skating, Art, Western Dance, Western Music, Indian Dance, Indian Music, Instrumental Music as mandatory subjects. In this fast moving materialistic world it is essential to inculcate good moral values like honesty, truthfulness, tolerance, sincerity, courtesy etc. Special focus is laid on Value Education in these formative years and it is integrated into the curriculum. The tests in junior school are informal and gradually by class V formal testing eg. unit tests are introduced. Testing is done in a variety of ways and various tools and techniques used so that all students get an opportunity to perform. The school follows a system where the year is divided into two terms. The first term is from April to September (usually). The second from October to March. Unit tests-Though the weekly test marks are not given any weightage in the final results, children hardly ever miss them. The syllabus for these tests is given out a week in advance so that there is ample time for preparation. Terminal exams-The 1st term exams are held in the second half of September or the first week of October. The answer sheets are given back to the students after evaluation with appropriate comments and suggestions by teachers. This is followed up on parents’ day. 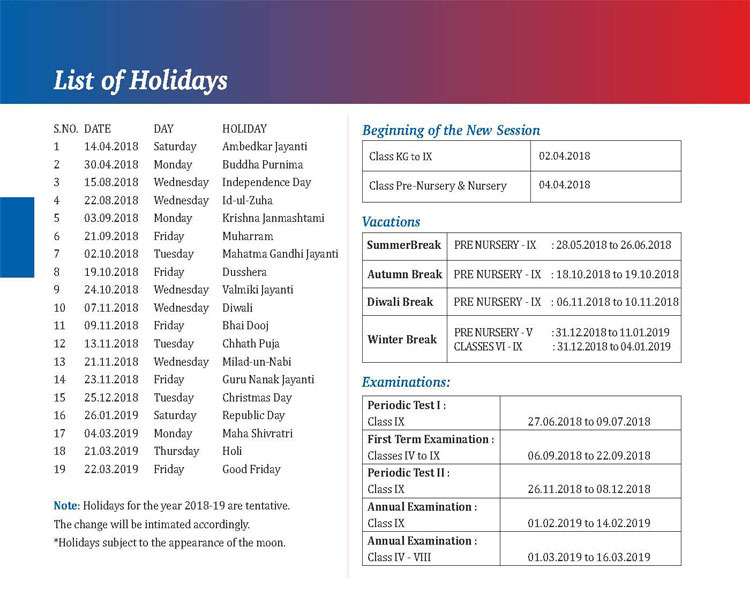 The 2nd term exams are held in March. Merit cards are awarded to the students in all the subjects. The cut off mark for each subject varies and the threshold is periodically reviewed and revised as necessary.